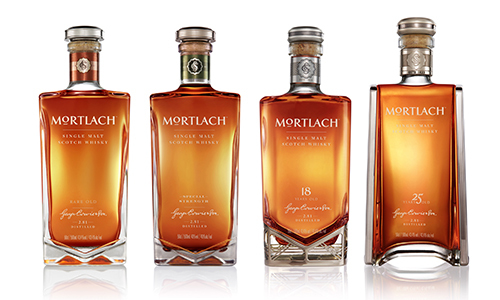 March 4, 2014– Diageo’s plans to engineer Mortlach as a luxury single malt brand took a major step forward today with the unveiling of pricing and packaging for the four expressions to be released this summer. The malts will come in bespoke bottles designed by the New York and Paris-based design firm Raison Pure. The bottles are a tribute to Scottish engineering heritage, with a range of girders and arches reminiscent of those found on the landmark Forth Bridge near Edinburgh. The four expressions will come in two sizes: Mortlach Rare Old, Rare Old Special Strength (travel retail exclusive), 18 and 25 year old will be sold in 500ml bottles in Europe and Asia, while the US will receive 750ml bottles. 500ml bottles are not legal for sale in the US under federal law. The initial rollout will come in late June and early July in London and Berlin, followed immediately by Singapore, Taiwan, Beijing, Shanghai, and Hong Kong. The Mortlach whiskies will arrive in New York, Chicago, and San Francisco this fall. To learn more about the distillery and its unique 2.81X distillation process, listen to Episode 454 of WhiskyCast for a tour of Mortlach with distillery managers Steve McGingle and Sean Phillips, along with a discussion of the four expressions with Diageo master blender Dr. Matthew Crow. Anyone still believes in the ideals of the whisky industry? Marketing and Finance folks are getting the upper hand. The 500 ml bottles just prove that it’s a cut-throat business like any other one, using the same tricks like all other food vendors – decrease the contents (while giving the impression of the contrary thru packaging) and increase the price – customers will swallow it! US is well ahead of Europe with the defined size of a bottle! Hope to get hold of some more F&F bottles now.